If you and I have anything in common beyond nail polish, there's a good chance the name of this collection brings someone specific to mind. 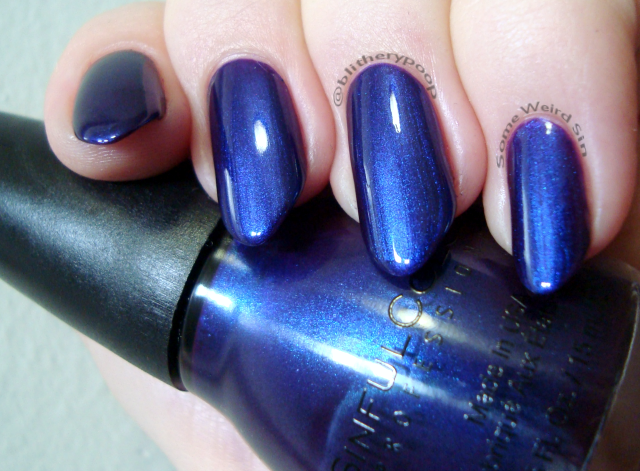 No Filter has intense blue shimmer in a purple jelly base. Outstanding, isn't it? No Filter is easily one of my favorite new shades of the whole year. It might even be one of my all-time favorites from the brand. Stunning, and ideal for fall and/or Halloween. The formula's good too. Two coats would cover, but I added a third for depth. Ink Positive is a deep red-violet crelly. Another breathtaking beauty! I feel like I probably have something similar, but hey...99 cents. We'll know for sure when I update my clicky sticks. They're painted, but I still have to sort them in. Back to the polish at/on hand, the crelly finish did take a little building, but the formula was smooth and easy to work with. Three coats would probably be plenty, but I did a fourth to hide VNL. Purple Haze is metallic mauve. This would have fit perfectly into 2012's Hot Flash Metallics (the first collection I ever swatched, I think), though it's not as chromey as Moss Have and Gone Platinum. I don't exactly love the color, but it's a one-coater. I didn't realize that at first, so most of my nails have two coats. My pinkie just has one. I'm thinking it probably stamps well, but I haven't tried it yet. Rose Dust is lilac with white shimmer. The only re-release in this collection, Rose Dust was first out in spring...as part of a collection that never showed up around here. Dunno if I'd have bought it then, but again, 99 cents sale. You know how that goes. It toes that line where it's almost pastel, but not quite. There's also something kinda frosty about the shimmer, but it's not a full-on frost. The formula's thick, but workable. This is two coats. I mattified this one too, and I like it more that way! Nothing remotely frosty anymore. Plum Luck is a magenta crelly. I think there's a Sally Hansen shade that's not too far off from Plum Luck. 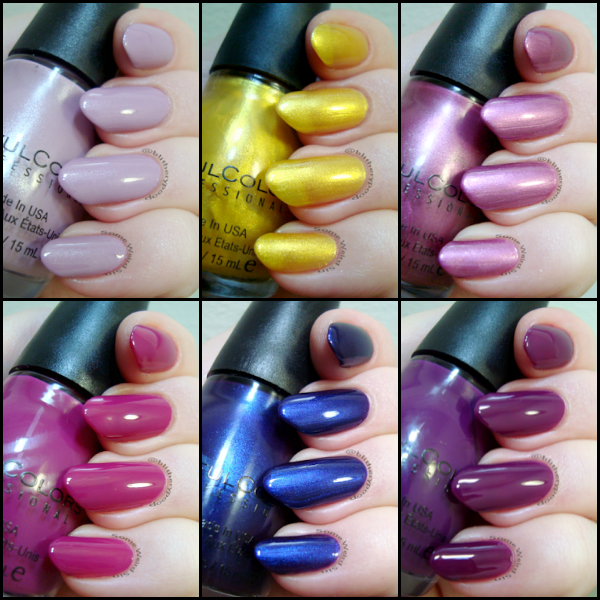 [I think there's also a Sally Hansen Plum Luck.] Another mystery for the clicky sticks to solve soon. No way I wasn't gonna buy this perfectly "90's brunette Barbie" crelly though! Bonus, the formula's as great as the color! This is two wonderfully smooth, easy coats. Antique Your Interest is a canary yellow shimmer with a sudden green shift. G. of Nouveau Cheap mentioned that Antique Your Interest reminded her of the old version of Let's Meet. They're not dupes, but I do know what she means. Antique is a paler yellow with finer, denser shimmer, and it's not as sheer. I didn't need undies here. There's also a green shift that my camera just wouldn't catch. It's rarely visible in person, since it's only at the absolute edge. If you hold your hand just the right way...and up over your head, you'll see the green flash. It would probably be more visible over a darker base, but I did a layering test and didn't like the result. The yellow base is a bit too yellow to play well with other colors. It's a compromise, since it means it's wearable on its own. This is three coats. Bottom line: Great bunch! No Filter is my obvious favorite. 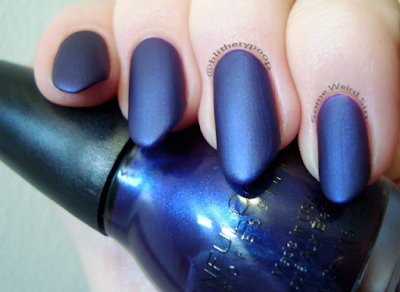 Ink Positive and Plum Luck are both eye-catching, with good formulas. There's nothing here I wouldn't recommend. ...and I could totally see Joy wearing any/all of these shades. Right? Now I wanna watch that show again.